Now that Apple Pay is live in the UK, I thought it was time to try it out. Initially I thought Apple Pay was limited to the iPhone 6 and that I’d be left out in the cold (until they release a new 4″ version of the iPhone), but I was informed it works with the Apple Watch on its own. This isn’t the most obvious thing and the option to set it up isn’t the most obvious either! I’ve taken a few screenshots to show you how far I got. Which, sadly, wasn’t very far. I’m running iOS 9, beta 3 and Watch OS 2, beta 2. First, open the Watch app on your iPhone. You should now see an option to Add Credit or Debit Card. When I clicked it, I simply got an error. Probably due to the fact I’m running beta software. If you get it working, please let me know. I’m tempted to switch bank just to avail of this platform. Barclays, it seems, are pushing their own bPay technology. 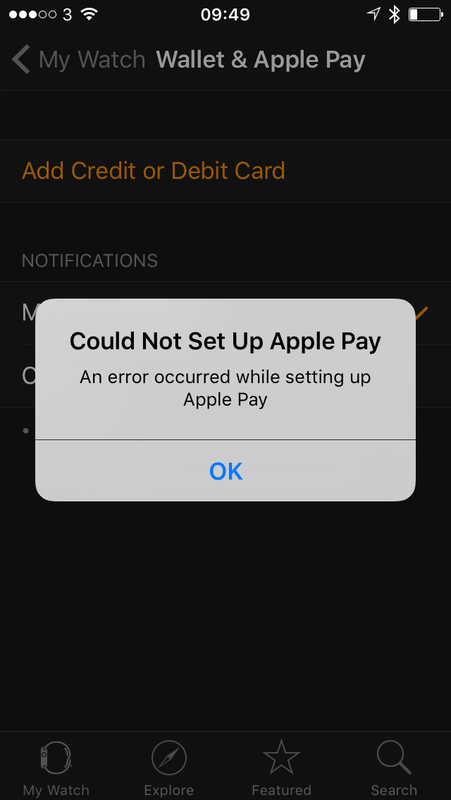 I suspect they’ll keep that for a few months and then support Apple Pay anyway. Hi Tom I can confirm apple pay works with and iphone 5 and the apple watch. Adam, I finally figured out that the Watch would support Apple Pay by itself. Using it for my journeys on the London Underground now!